Custom logo pistachios make appropriate and delicious promotional giveaways for all types of events including trade shows and conventions among others. 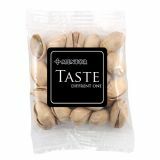 Offered in stylish packages, personalized pistachio nuts make wonderful gifts for holidays, special occasions or in fact any time of the year. 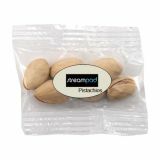 ProImprint offers a range of custom logo pistachios to choose from to put your brand on broad display. Shop today at ProImprint and avail the lowest price match guarantee, FREE set up and artwork assistance on every order, discounts on bulk purchases, rush orders, quick shipping and much more! 100% customer satisfaction guaranteed! 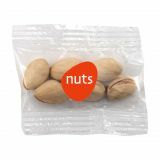 Food gifts are hot favorites in gift circuits and by giving pistachio custom nuts you can convey the message to the recipients that you care about them more than your business. 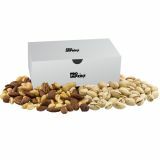 Gift these nut filled gift boxes with your business cards and enhance your brand recall value. Roasted to perfection and packed with care, custom pistachios will make elegant and value added gifts for incentive programs or holiday promotions. Logo pistachios can be used to promote gym, fitness classes, wellness programs, marathons and sports league among others. Tasty and packed with nutrients, antioxidants and muscle building proteins, pistachios make perfect snacks for athletes and sports people. Pistachios help the recipients to replenish the essential nutrients they lose during exercise faster than sports drinks. 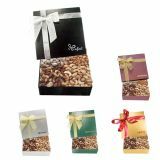 Gift these carefully selected nuts as tokens of appreciation to your customers or employees and they will surely thank your business for being considerate to their health and well-being. 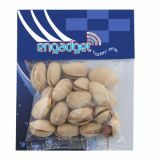 Your employees will drive up your brand image every time they take out these custom promotional pistachios in the park, on the move or even during their tea break in the office! People around cannot help but notice your brand and heed to your business messages that scream out from these imprinted packages. Personalized pistachios will also make wonderful gifts for birthdays, milestone celebrations and more. Packed in double sealed packages that retain the freshness and aesthetic value, custom pistachios will go a long way in placing your brand in an elite and professional manner. 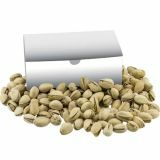 ProImprint offers a full range of custom pistachios for your promotional needs in all possible types and prices. Pick up the ones that suit your brand identity and make your brand promotion a healthy and tasty affair for your customers and business patrons. If short listing your choices from the multitude of options is tricky, just call us at 844-776-4677 or email us at info@proimprint.com and we will help you make your choice.